In Part 1 and Part 2 of this series we had some helpful tips for planning an outdoor room for homes here in the Minneapolis and St. Paul area. In this post we’d like to focus on the most popular type, the outdoor kitchen. Outdoor kitchens are all the rage for homeowners not only here in Minnesota but also all across the country. Now that spring is here and summer isn’t far behind, why not have a space where you can take that delicious meal planning, preparing and cooking (and then eating) right to the warm outdoors in your own back yard? Gather with friends, and eat your meals together. Spring is a great time to start planning that outdoor kitchen you want, so you can get started with the installation as soon as the ground thaws. The kitchen is the heart of the home, so why not bring its convenience out into your yard as well? Not only will you appreciate it, but when it comes time to sell your home it will be a big plus. With many prospective buyers focusing on kitchen facilities, seeing an outdoor kitchen will make your home one they’ll put at the top of their list. Adding an outdoor kitchen is a great way to boost the return on your investment in your home. In addition to this, it is always a beautiful place to come together with your family and friends. Many homeowners are making the switch to outdoor living, using their yard wisely and really making it stand out while also being functional, allowing them to cook many different meals, enjoy time with one another, and actually love being in the yard. The grill in the outdoor kitchen is usually its main focus. Not only is ALD able to install the grill for you, but we can help you choose the ideal one for your outdoor kitchen. There are many types available – from gas to charcoal to wood-fired and more. The right grill for you will depend on a variety of things, which we can help you evaluate. In addition to a cooking area, there are other things that can be included. Many outdoor kitchens also have a fridge, a pizza oven, and even running water. After all, what kitchen is complete without a sink? We are able to provide you with all that you could possibly want, including cabinets and counters. 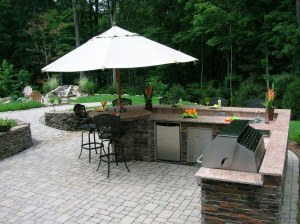 The right furniture for your outdoor kitchen area is very important. It needs to be comfortable and functional, yet have a style that works with the overall look of your outdoor kitchen and the rest of your landscaping. If you’re looking for something special, we are able to provide custom-designed natural stone furniture that makes your space truly unique to you. In addition to that, we can suggest other elements for the space that will hold your outdoor kitchen, including landscape lighting. Obtaining the perfect look for your outdoor kitchen shouldn’t be hard to do. Just call on us here at Architectural Landscape Design, and we can help you with everything from designing and planning to installation to make it the best it can be. We are a licensed MN landscaping company, and we are here to listen to your ideas and make them a reality this year.